This issue of TLS eNews continues to explore the impact labyrinths have in modern life, as we introduce "Labyrinth Locations," another segment from The Labyrinth Society’s DVD, Labyrinths For Our Time. Labyrinths create quiet oases and provide opportunities for team building and creative problem solving. They are a place where people can enjoy and appreciate life and relieve stress. This video excerpt highlights the many venues where labyrinths reside, including public parks, gardens, historic monuments, artistic installations, public and commercial buildings, libraries, visitor centers, recreational facilities, and more. Many of these labyrinths are in breathtakingly beautiful settings with waterfalls, fountains, benches, and fabulous views offering idyllic lunchtime interludes for local workers, accessible weekend excursions for families, and points of interests for visitors. Public installations attract the best and the brightest labyrinth designers and builders eager to create unique, permanent labyrinths specific to each setting. One example is the Snoopy Labyrinth at the Charles M. Schulz Museum in Santa Rosa, CA. 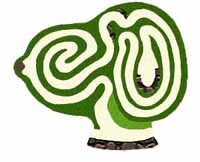 Created by Lea Goode-Harris, it is a contemporary meander labyrinth in the shape of Snoopy’s head with the center right in the middle of Snoopy’s brain (Lea tells the story of meeting two little boys sitting on the rock that marks Snoopy's nose. They cheerfully explained to her, "We're the boogers!"). To find a labyrinth near your home or while traveling on vacation, visit The Labyrinth Locator, a website with a searchable database of nearly 5,000 sites around the world.